So we all write about power, such that we can have more power. It doesn't matter what title we put on it, everything is based on wanting power. I use Astrology as that is my tool for my concept of power. I then use my sense of questioning to ask the right questions. Don't ask stupid questions is what I say to myself most of the time. Conversely find out why some people don't ask certain questions. Today I wrote about Alexander the Great being half Iranian. Just think how the world would have been if we had known all this sooner. What if that great nation Alexander built had remained? Following on from the coincidence theme, I am turning more pages of Time magazine and I just saw this page with these three pictures. 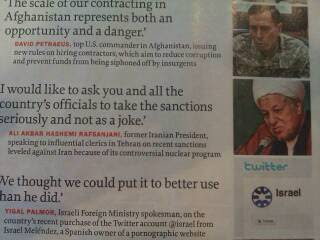 You ask, "how come Rafsanjani is there between Petereus and Twitter"? He is getting it from two sides. But US is above him telling what to do as Twitter is hitting him from below. Just now I am sitting here on my day off. I still subscribe to Time magazine and I am looking at page eight and notice the bit about US doing a US $60 billion deal with Saudis. I am thinking what got that deal? Is it the Ayatollah fear as spread by US media? So as this Q and A is buzzing through me I hear a marching song on 1club.fm classical channel. What does all that tell you? It made me laugh as a bystander in this chain of events. Is there a hidden message? What a coincidence. I call this "a reality check" in an existential way. This bloke I bumped into yesterday told me its Synchronicity. All I know it made me laugh and felt Ahuramazda in me.